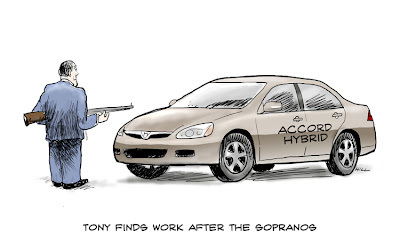 A national publication for the automotive industry just hired me to do a weekly "editorial cartoon" ...and being a car enthusiast, I jumped at the chance. The Sopranos ended its long, fabulous run on HBO this week, too. You never know what will happen when you throw two unrelated subjects into a blender but this time it seemed to work okay.